System Shock 2, released in August 1999, takes place 42 years after System Shock in the year 2114. Aboard the first superluminal starship, you awaken from your cryogenic sleep and try to figure out what's happened. In this first person shooter with RPG elements, you must purchase or acquire skills to decide what weapons you will be proficient with. Best Impossible difficulty time: Single-segment 0:27:31 by Dmitry 'KhanFusion' K. on 2012-08-23. The single most important thing in the run takes place in the maintenance conduit at the two minutes mark. Normally, death in the game without QBR machine activated is followed by two things: your controls are disabled and a few seconds later you are thrown out to the main menu. However, if you die while flying in mid air and then land on a ladder, you automatically grab it which results in the controls being restored, and moving to a new area allows you to stay in the game forever. Additionaly, for some reason the game gives you 1 health point, but most importantly you become completely invulnerable to all forms of damage - falling, radiation, bullets, pipes - nothing can kill you. This allows for active use of speed boosters, which double your speed and also happen to be very cheap to dublicate, as they are not sold in the replicators. There are some minor adverse effects as well. First, you can't do death-abuses, and also, since you move openly without invisibility, you stir up the local public who can be quite a hassle sometimes. In this run the closest moment when that could become trouble happens in the Rickenbaker. That rumbler, dancing near the security crate from which I make a jump over the railings, have an annoying habit of putting himself right in my way. This time he was quite literally one step away from ruining the run. The use of speed boosters makes possible three major skips in the game. The first one is in Engineering, where I jump over the trigger that activates the body of the many cutscene. On my way back I step into the trigger so I move quickly to the exit to prevent the cutscene from starting. 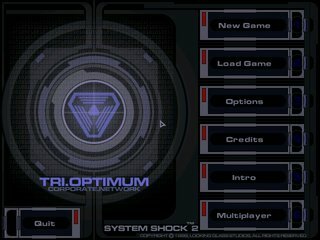 It is quite a tricky jump that took some effort to iron out, and a much easier alternative that you might think would work - activate the trigger, rush to the exit before the cutscene starts, then return to the sector hoping that the cutscene 'goes away' - fails. The second skip is in Polito's office. When the cutscene starts, invisible walls rise from the floor and block your exit. In the previous runs quite a bit of precision was involved in avoiding this to happen, but you can actually walk around the trigger and dash through it and above the wall from behind, making the trick very easy. And finally you can jump over the trigger that creates a wall blocking the exit to the Rickenbacker, similary to the way it was done in Engineering. It is much easier to do, however. There is no annoying low doorframe, you have a wall you can comfortably lean on, and a quantum relocation teleportation marker turns out to be a much more convenient object to stand on compared to an armor or hazard suit. The spider can activate the trigger too, so it is dispatched quickly. The final trick worth mentioning is taken from the previous runs. Enhancing skills takes effect immediately, even when you can still undo the enhancement and get a refund. This can help with technical skills like repair, maintanence or research. The trick is used at hydroponics upgrade unit to research Toxin-A quickly.